For another time after a 33-year leave of absence which stretched between 1979 and 2011, the Vuelta returns to the Basque Country tomorrow. This all-Basque stage from Getxo, near Bilbao, through the historic town of Gernika and looping around and up the unraced peak of Oiz, has been labelled the race’s most beautiful by organising chief Javier Guillén. Few will care if the view out to sea is shrouded in the txirimiri, the famous Basque drizzle, or even if the race helicopters cannot fly at all. This stage is about cycling folklore, the reconnection between a sport and its oftexiled heartland. The climb of Oiz (also known as the Balcón de Bizkaia), one of nine summit finishes in this year’s Vuelta, is defined by its irregularity, with a switch of road surface and ramps of 17 per cent at multiple points en route. The final ascent of 7.3km averages 9.7 per cent, taking the race to the exposed ridge of turbines at an ancient messaging post for the four corners of Biscay province. Earlier parts of the stage’s 166km are classic Basque ‘wooden rollercoaster’, with six stubborn climbs in total and little respite for weary third-week legs. The final piece of the puzzle for Basque cycling is the re-emergence of a pro team. Enter Euskadi-Murias, founded in 2015 and backed by a local construction firm, who are in their debut season at ProConti level. Their receipt of wildcards for a series of plum stage races this year, from the Volta a Catalunya in March to the Vuelta, suggests that many within the sport are supportive of their rise, and aware of the commercial potential surrounding it. Following in the hallowed wheeltracks of Euskaltel and harnessing considerable support from its home fans, Murias aim to be “protagonists” on their grand tour debut. “The stage to Monte Oiz is going to be one of the most important points of this project since its birth,” Odriozola continues. “All the fans are going to be waiting for us and we are all going to enjoy that Basque cycling returns to first-world level.” The Basques and the Vuelta need each other. The race can’t exclude its most fervent and knowledgeable supporters - not to mention some of Spain’s most evocative landscapes and a strong regional economy - if it is to shake off rumbling threats to its three-week form. The fragile Basque cycling ecosystem, in turn, requires exposure and sponsorship to channel all that positive energy into tangible reward. “From now on, we need both politicians and institutions and everyone in the Basque Country to identify with this project, value what has been achieved and from there support us,” Odriozola says. not only the Euskadi Murias team will have a special eye on this stage, there are also several other Basque riders in the race, among them Ion & Gorka Izagirre, Pello Bilbao & Omar Fraile, Imanol Erviti, Igor Anton, Jonathan Castroviejo, Markel Irizar, Alex Aranburu and Loïc Chetout. While Yates' team would probably to happy to let a breakaway stay clear, Movistar and Astana look likely to opt for a victory from the peloton to keep their chances to win the jersey. This could mean Erviti, Fraile and Bilbao will have to work in the peloton to bring back their fellow countryman in the break. All the other riders had a very easy day yesterday, but will Kruijswijk have anything left on the tank (and more than Valverde and Yates?) after yesterday’s hard start to the time trial? I don't really know what a Kruijswijk stage looks like, except it isn't the super-steep muritos of the Vuelta. What about that long monoclimb, the first Andorra finish? It is not steep, just long. I'd think best suited to him are old-school long multi-mountain stages, at altitude and with medium gradients. So basically everything where recovery and durability becomes most important. So what comes closest (although it's short) is probably stage 20. Double Dutch, this year has a whole new meaning. Masters of the GT, week 6 peak. These Vuelta climbs may not be Kruijswijk's top trump, but what remains are probably the most suited to his capabilities. He now is a serious contender for the red jersey, so beware. Quintana’s last chance of the race IMO, if Valverde finishes with him today then Valverde will surely become the protected rider. Similar for López in that he has to gain significant time on Kruijswijk and Mas today in order to get a podium, and Yates and Piti if he wants to go for the win. So, to my mind, Quintana and López need to scoot off early and work together. Fu$&!ng Quick Step not only do they have two of the best rookie Sprinters/ Classics riders. Call me out of the loop (I am) I thought Mas & De Plus would be the new Verona & Serry. Now they’re looking like the new Contador & Van den Broeck!!!! Not only do they climb but Time Trial tooooo. let’s be honest they were never that bad. Maybe people hating on Bianchi. I’m sure most have changed there opinion with the Dutch teams recent successes. I have tuned out on this Vuelta for the most part, maybe focus more this week. Does Matthews have another win in him Paris-Tours?? I can only agree in that Quintana must not LOSE more time today. There are still stages 19 and 20 to come, and both suit Quintana's long-range climbing ability more than anything we've seen yet. Longer climbs. If Yates has saved enough in his legs, we saw in the Giro he should be able to match Quintana. However, we are also, once again, approaching the 3 week curse for the Yates. Stages 19 and 20. Not since this spring's Giro ( ) have we seen a GT decided so late. Love that shot - the Bee Man from the Bee team! Michael Woods was overcome with emotion after his win today. This explains why. Both riders came to cycling from running at a relatively old age. Busche fell out of WT after 2015 & retires in 2016 after 1 yr w/ UHG. Woods rides for Optum in 2015 were Busche started (then called Kelly Benefits) and enters WT in 2016 the year after Busche left. Of course one is American and One Canadian. Ones from Milwaukee the other Toronto (same relative Latitude, 11 hrs apart). Both are 5’9” 140 some pounds & 1.5 yrs difference in age. With Quintana and Kruijswijk both not entirely surprising thrown out the backdoor on the super-steep and irregular slopes up the Balcon de Biscaya, it is starting to look like this is a race between two very similar riders even if there's a generation gap between them: Simon Yates and Alejandro Valverde. Both are good allrounders with enough of a sprint in them to steal away with bonus seconds on occasion. Both of them are decent on a time trial, but what sets them apart in this edition of the Vuelta is both are very good climbers also on the super steep >15% slopes which feature on many climbs here this year. It is like the good old murito finishes just became longer, super steep climbs. (Even if not as long as the Angliru). The final two mountain stages will provide more gentle gradients, more altitiude and and different length stages. To my eyes, more altitude possibly favors Yates a little bit over Valverde. Lopez may be the high altitude specialist but he's far back now, isn't he? 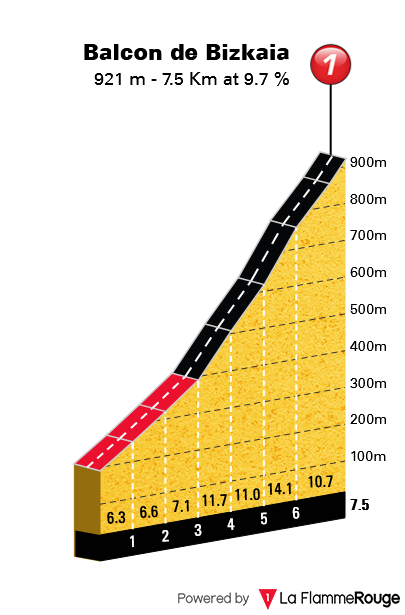 Stage 20 goes up and down the whole time, but stays below 2000 metres the whole time. 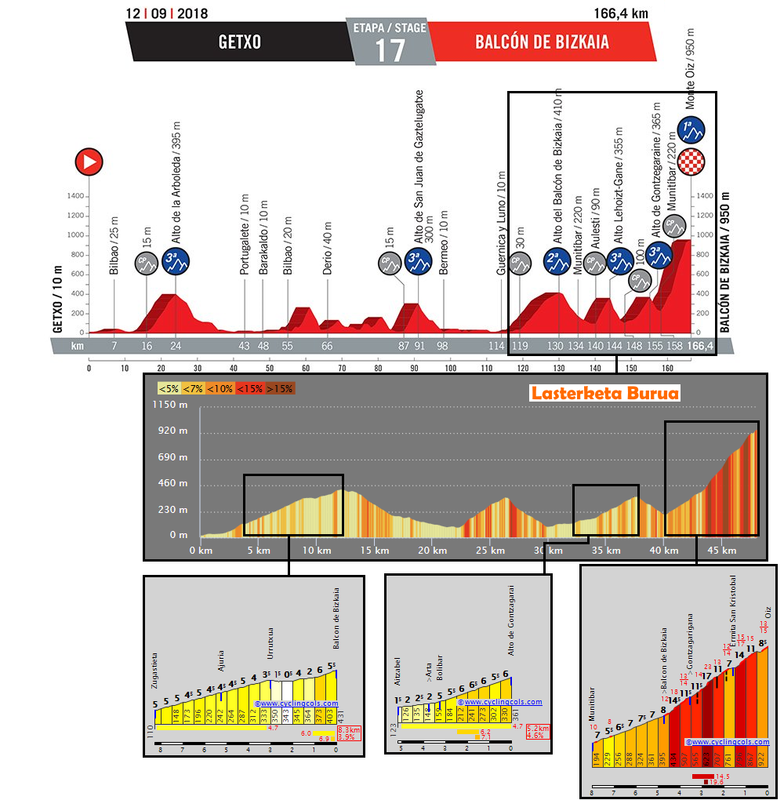 It includes some nice climbs where a difference could be made, but they are mostly in the first part of the stage. The penultimate ascent, the north side of the Comella, is the shortest and flattest climb of the day, and there is a five-kilometre (false) flat between the end of the descent between the end of the descent and the start of the final climb - which is also almost the longest flat portion of the whole stage. I don't see any of the favourites attacking on the Baixalis with >33 km out, it would most likely be GC suicide. So it's another case of stuff happening (or not) on the final climb. Even so, the stage contains 3000 altitude metres on less than 100 km - if anything can crack Valverde, this would be it. And what about Enric Mas? He's stealthily climbed his way up the rankings and is now on the podium - in his second-ever GT and his first as GC rider. Is that his upper limit and a Vuelta GC podium a great result for - or will they throw caution in the wind and go for broke to get that GT victory that has so long eluded Patrick Lefèvere? The sports directors in Spain are Rik van Slycke, Wilfried Peeters, and Geert Van Bondt. 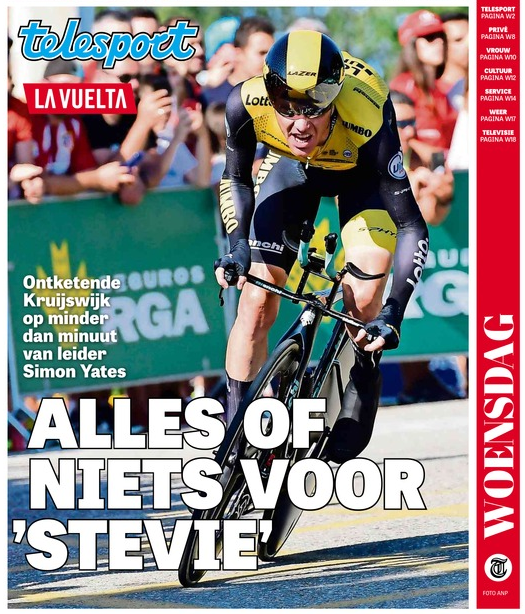 I don't know that much about them; but Peeters is one of their main classics DSs, so maybe he makes up a plan for an all-out assault on the red jersey. Not that high altitude, Sepp Kuss would win everything if the races took place at 3000 m +, yet at 200-2000m above sea level, the stage takes a good step up from the Balkon de Biscaya stage (0-1000m ) , and in cross country skiing they reckon the high-altitude perspective is important at 1800 m (although they do more or less the whole race, not just the final climb, at that altitude. Valverde is often suffering at high altittude..